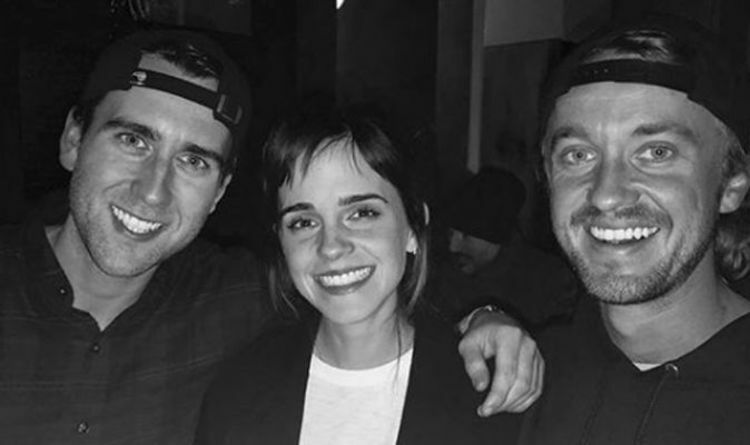 Emma Watson (Hermione Granger), Tom Felton (Draco Malfoy) and Matthew Lewis (Neville Longbottom) are seen in a photo Felton posted on Instagram, seven years after their last on-screen adventure. Felton captioned the snap: “School mates #hogwartsalumni”. It’s had nearly one million likes on the platform, just eight hours after being posted. It’s not known where the picture was taken, or when for that matter – as Felton’s other recent pictures have all been posted from Mauritius. All three stars have continued to enjoy successful acting careers since completing the eight-film franchise in 2011. Felton, 30, will soon be seen alongside Daisy Ridley, Naomi Watts and Clive Owen in Ophelia, though it received decidedly mixed early review from the Sundance Film Festival. He’s also recently been seen in a recurring role in The Flash. Watson last year starred in the box office-conquering Beauty And The Beast, as well as the little-acknowledged flop The Circle. As for Lewis, he’s found much success on the small screen: he played Tom in ITV’s Girlfriends earlier this year, and has also been in Happy Valley and Death In Paradise. He’ll next be seen on the big screen in Terminal, alongside Margot Robbie. Meanwhile, the Harry Potter franchise lives on via Fantastic Beasts and Where To Find Them. After the first movie found success in 2016, the second – Fantastic Beasts: The Crimes of Grindelwald is out this November. Elsewhere the two-part West End play, Harry Potter and the Cursed Child, is still playing on the West End. JK Rowling’s other venture is her crime novels under the pseudonym Robert Galbraith; the fourth of which is due later in 2018.